From 6 January onwards, Ambon was attacked by Japanese aircraft. Allied aircraft made some sorties against the approaching Japanese fleet, with little success. On 13 January, the two Buffalos, piloted by Lt Broers and Sgt Blans, attacked a flight of 10 Zero fighters. Broers' plane was hit and caught fire, but he continued to attack until it became uncontrollable, at which point he abandoned the Buffalo, using his parachute and landed in the sea. Blans was also shot down but also managed to use his parachute, landing in trees on Ambon. Both men were rescued. Broers suffered severe burns and Blans had 17 different wounds. On 30 January, about 1,000 Japanese marines and IJA personnel landed at Hitu-lama on the north coast. Other elements of the 228th Regiment landed on the southern coast of the Laitimor Peninsula. Although the Japanese ground forces were numerically not much bigger than the Allies, the Japanese had overwhelming superiority in air support, naval and field artillery, and tanks. The remaining Allied aircraft were withdrawn that day, although RAAF ground staff remained. Within a day of the Japanese landings, the Dutch detachments in their vicinity were overrun and/or had withdrawn towards Paso. The destruction of bridges on Hitu was not carried out as ordered, hastening the Japanese advance. There was a second wave of landings, at Hutumori in south eastern Laitimor, and at Batugong, near Paso. An Australian infantry platoon was detached to reinforce its the pioneers on Nona plateau. The defences at Paso had been designed to repel attacks from the north and west, and now faced assault from the south. A KNIL platoon was detached from Paso to resist the attack on Batugong, causing a gap in the Dutch lines. The Japanese took advantage of this, and were assisted by the failure of a KNIL telephone line. Batugong fell in the early hours of 31 January, enabling the Japanese to encircle the eastern flank of the Passo positions. Meanwhile, Kapitz ordered the Ambonese KNIL company at Eri to take up a position at Kudamati, which appeared prone to attack. 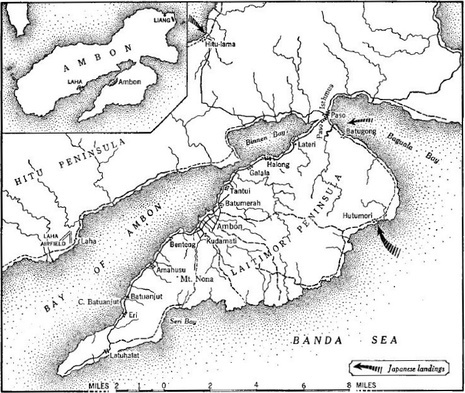 The island of Ambon, 1942. The arrows indicate the main Japanese landings. The town of Ambon is in the centre of the main map, Laha airfield is centre left, Halong naval base is centre right, the Passo isthmus is upper right and Eri is lower left. [a]t 6 p.m. a motor-cycle with sidecar was seen on the road to the west of the Passo position showing white flags and travelling towards the Japanese. Firing on the Passo perimeter was suspended on the orders of the Dutch company commanders, and the troops were allowed to rest and eat. It is not clear who authorised the surrender. There was no immediate response from the Japanese, and — in a meeting with company commanders — Kapitz and Tieland ordered the Dutch troops to recommence fighting. However, when Tieland and the company commanders returned to their positions, they found that their troops had been taken prisoner, and they were forced to surrender. The first land attack on Laha occurred on the afternoon of 31 January. An Australian platoon north-east of the airfield was attacked by a stronger Japanese force, which it repelled. 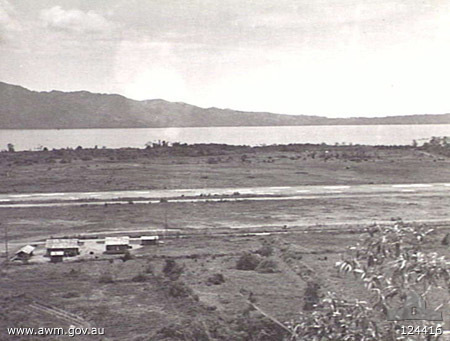 Japanese forces were also approaching the town of Ambon from the south west. At about 4 p.m. on 31 January, the Japanese captured the town, including an Australian casualty clearing unit. mountain guns in high ground were shelling a Dutch artillery battery on the coast at Benteng, which was forced to withdraw, putting further pressure on Kudamati. infantry attacked the eastern flank of Australian positions at Amahusu. The Australian positions were also receiving large numbers of Dutch personnel fleeing from Paso. At 10:30 p.m., Scott ordered a withdrawal of the Allied forces at Amahusu and the south west, to Eri. The position at Kudamati was effectively encircled. On 2 February (some sources say 1 February), the Japanese minesweeper W-9 struck a mine laid by the Dutch minelayer Gouden Leeuw in the Bay of Ambon and sank. Two other Japanese minesweepers were also damaged by mines. After dawn on 2 February, the main Australian force on Nona plateau, commanded by Lieutenant Bill Jinkins, was in danger of encirclement. Jinkins ordered a withdrawal to Amahusu, where he became aware that the Dutch had surrendered. Unable to ascertain the disposition of Lt Col. Scott's force, Jinkins decided to meet senior Japanese officers under truce at the town of Ambon. They allowed him to speak to Kapitz, who wrote another note advising the Australian commander to surrender. Jinkins set off to find Lt Col. Scott. Meanwhile, the Japanese forces attacking Laha were reinforced and a concentrated assault on the Allies began, including naval artillery, dive bombers, fighter planes and probing attacks by infantry. A Japanese night attack in high grass near the beach, between two Allied positions, was beaten back by an Australian platoon. However, a massive Japanese offensive commenced at dawn on 2 February. By 10 a.m., only about 150 Australians and several KNIL personnel were still able to fight at Laha, and Newbury ordered them to surrender. By the morning of 3 February, the Australians around Eri were struggling to cope with increasing air and naval attacks, wounded Australians, the influx of Dutch personnel, diminishing supplies and widespread fatigue. A Japanese flag had been seen flying on the other side of the bay, at Laha. By the time Jinkins reached Lt Col. Scott, the latter had himself met the Japanese and decided to surrender. The Allied position at Kudamati was surrendered separately at midday.